The seating arrangement questions was one topic that was asked in all the slots of the IBPS CLERK PRELIMS EXAM 2017 and hence this is one of the important topics that cannot be undervalued. From all the reviews and analysis, it is evident that reasoning section is the scoring part out of all the other sections. The Reasoning section is easier to attend and the scoring is also easier. 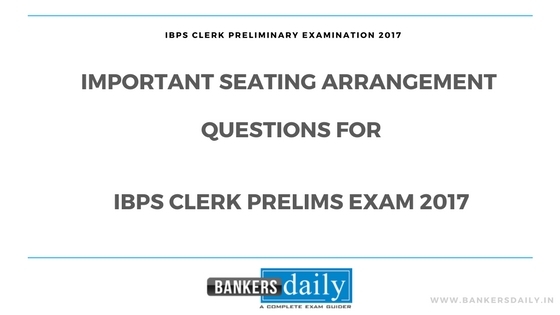 So try these seating arrangement questions and get yourselves prepared for the IBPS CLERK Prelims Exam 2017. The number of questions asked in the various slots shows that it was not constant and changing from slot to slot, so a maximum of 10 questions can be asked in the seating arrangement questions and on the other side, a minimum of 5 questions can be asked in the forthcoming batches of the IBPS CLERK Prelims Exam 2017. Q (6 – 10) Read the following information carefully and answers the given questions below. 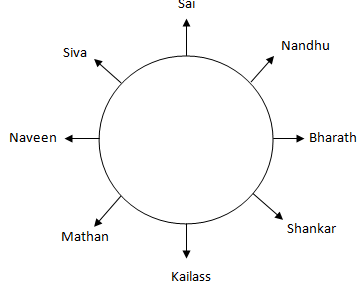 Eight persons Aruna, Abi, Achu, Adhi, Anup, Asma, Ahkila and Aarathana are eight friends sitting in a row all of them are facing north. Each of them has different laptops viz, HP, Dell, Sony, Lenovo, Apple, ASUS, Acer and Microsoft (not necessarily in the same order). Adhi has Dell laptop and is sitting second to the left of Asma. The person who has HP is sitting adjacent to the person who has Dell. Ahkila has Acer and is sitting four places away from the person who has Apple. Only Achu is sitting between Asma and Adhi. Asmadoes’t have Microsoft. Anup is sitting third to the right of Adhi and has Sony. Aruna is not sitting next to the person who has Acer and doesn’t have ASUS. Achu has Apple. Neither the person who has Lenovo nor person who has Microsoft is sitting at the extreme corners. Ahkila sits right end of the row. 6. Who among the following has HP laptop? 7. Asma has which among the following Laptop? 8. How many persons are sits between the one who has Dell and the one who has Sony? 9. Who may be sits in the end of the row? 10. Who sits second to the right of Asma? You can check the answers of the Seating arrangement questions from the below links. If you have got everything correct, you are great to go in the IBPS CLERK EXAM and it will easier to solve the seating arrangement and puzzle questions in the IBPS CLERK PRELIMS EXAM 2017. You can also check the article on, how to approach seating arrangement from the links given below. You can also try the other Puzzles and Seating Arrangements questions from the links given below from our IBPS CLERK PLANNER 2017.